There's not much I can really add to what has already been said on this blog about Amnesia, so thought it best to dive straight in. I wouldn't really describe it as a game, more an interactive experience. An interactive experience that scares the hell out of Neil. 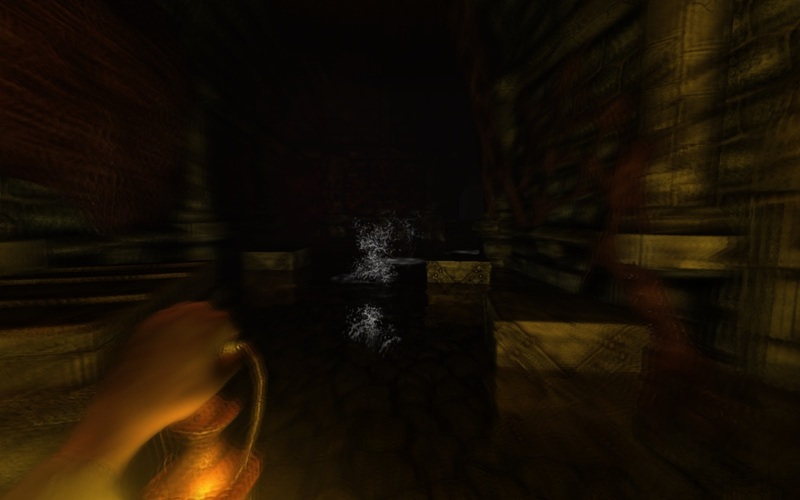 Whilst Neil takes the slow, methodical approach to Amnesia, immersing himself in its world, I decide it best to deal with Amnesia the way I deal with most horror related things in real life. To run through it, fingers in my ears, telling myself its okay, because it's not real. It started off well, but as you can tell from the title of this post - it didn't end that way. I remember seeing all the previews for Amnesia on RPS before it was released, watching all the trailers and reading the guys take on it all. From watching the clips on youtube, I could tell the developers had put a lot of time and effort into the audio/sound effects. I think this is what makes it a truly great game. However, it wouldn't be until a steam sale that I would actually get round to picking it up. Unfortunately, like most of the games I bought during a steam sale, I think I only played it for about 15 minutes. Partly down to other games to play (namely games I'd bought in a previous sale...) but mostly down to fear of playing it. So I'm ready. It's pretty dark in my flat. The gamma looks good. Headphones are on. "I ain't afraid of no ghosts" - Ray Parker Jnr. I've mastered the complex door mechanics, and picking up tinderboxes. Sure, the screen shakes every now and then and the heavy breathing is a bit weird. But I'm able to progress quite quickly. I've done this bit once before, so nothing is really that shocking. I chose to ignore all of the silly scary stuff. Oooh a door closes. Big deal. I move on. I pick up some notes, but I don't have time to read them properly. Esc. Carry on. I fall to the floor for some reason. Think because of the blood on the floor. Bah. Man up Daniel (that's the protagonist; not me). Controls have a gone a bit funny so I stand next to a lit candle. A few secs and we're good to go. Open another door, into the main entrance hall. Screen goes funny again. Try to open some doors. They're locked. Boo. Go into one room. There's a big blob of red in my way. My journal flashes up. Not gonna read it though. I'll read it later. Move through a few more rooms. A piano closes by itself. I re-open it. Must have been the wind. In one room I fall to the floor. I move towards a funny orb. No idea what it is. But activating it wakes me up. Or something. I chuck a stone at a wall. Wall breaks. I jump through. This is easy. Neil, what were you so scared about?! I pick up some more tinderboxes and oil. Light some candles. The shaking has stopped. I reach a room where I need to pull out books in order to open a door. Done this before. Plain sailing. Boom. Secret door opens. Now I've got a key to the wine cellar. As I wander off to the Laboratory more red blobs touch and damage me. These blobs are annoying. I pick up a container. I remember this bit too. This is the chemical bit. A simple fetch quest. The ground shakes quite a lot. I hear lots of grunting and more footsteps. But haven't actually seen any bad guys yet. I use the wine cellar key to open the wine cellar. Duh. This area has four doors...which is handy...I need four chemicals! 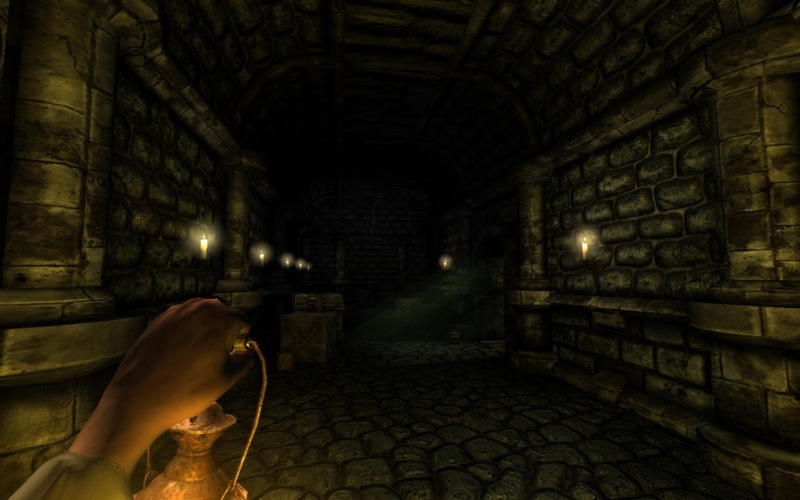 I pick up each chemical, from each room, refilling my lantern in the process. I trot back to the Laboratory and mix these chemicals up. After doing so, I get an acid which I can use on the red blob blocking my way. Head back to the entrance hall. Get hit by a few more blobs. Chuck the acid on the blob. Blob goes away. Success. I'm moving through the Refinery. I see something. I'm not entirely sure what it is. It's moving slowly. A tool tip flashes up telling me hide in the shadows. I want to get a picture of it, so I can show you guys. I put my lantern away and move closer. Closer. It turns to me. It's one ugly dude. And it hits me! I fumble the screen shot key and have to leg it! I move through one room and hide behind a large wood cask, Daniels breathing becomes my own. I stop for a bit. The sound of the "thing" has gone now. So I stand next a lit torch. That was too close. I creep back through the refinery. The thing is nowhere to be seen. I stop for a minute. Okay Neil, it is pretty scary. I take it all back. I'm much more cautious now. Screw this "speedrun". I move through each room. Lighting every candle/torch/bit of wood I see. I run round some rooms for a while. I'm not entirely sure I know what I'm meant do next. A few more laps and I then see some boxes guarding a small opening. I chuck them to one side and crawl through. In this room: a trapdoor, some rope and a crank. I try to turn the crank. But nothing happens. It's jammed. I follow the rope and see a stick lodged in the pulley. I jump and click it. This breaks it. I try the crank again. The trap door opens. I look down. Then jump. Seems all fine. Screen goes black. Then this. It's over. I have no idea what just happened. But I'm dead. Great. I can't believe I only got about 5 minutes further than I did the first time, after buying it in the steam sale. I have exactly the same feeling I had at the time too - I don't really want to load it up again!! In all honesty, even though I had covered it before, I think I did ruin the experience by rushing through the first section. The first time I played it, I investigated everything, read all the notes. I also ran out of tinderboxes and oil early on. All of which increased the tension I felt. If I come across as a bit flippant during the first section of the playthrough, then I apologise. This was purely an attempt to indicate the speed at which I completed that section. 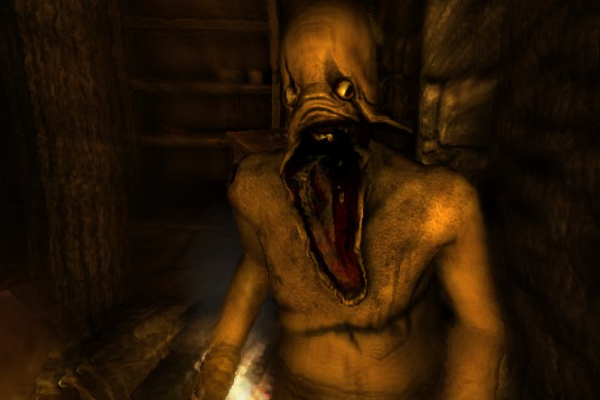 The work that Frictional Games have done with Amnesia is incredible and I'll definitely come back to it, after this project is finished. I still don't think its a game though. It's an attack on your senses. I'll leave you with some sage like wisdom, the screen presented to me upon death. Take note Thom and Neil. It is sound advice. Time until death: 45 mins - ish. I was sort of expecting Beardmouth to kill you. Ohh well. Some friends and I did a co-op playthrough of (part of) this. We each fired up a Google hangout and proceeded to scream like children as we all played through the game for the first time. "You go into the next room first." "To hell with this, I need more scotch." It was a full party wipe at the water monster. I haven't gone back since, but I think co-oping it like this is an interesting way to play it, especially if your friends are all 20-something man-children. Actually, I have some scotch at home...I should have grabbed it to calm my nerves. Well Ben, you're just blowing through the list like a....thing that blows....Ohh well, let us check whats next on the list(checks list)....."And Yet It Moves"........the heck is that? Okay, first of all, the idea of this project is amazing. I may even consider doing something like this myself. It would certainly relieve some of my shame discovering I haven't even played 40% of my Steam games. Secondly, Amnesia. Nowadays I read everything I can find about it, just because I can't bear to play it anymore. Let that be a warning to you and everyone that is considering diving into it: this game consumes you, permanently. The first time I played it, I went non stop for 45min. Then I died at "The Water Part". 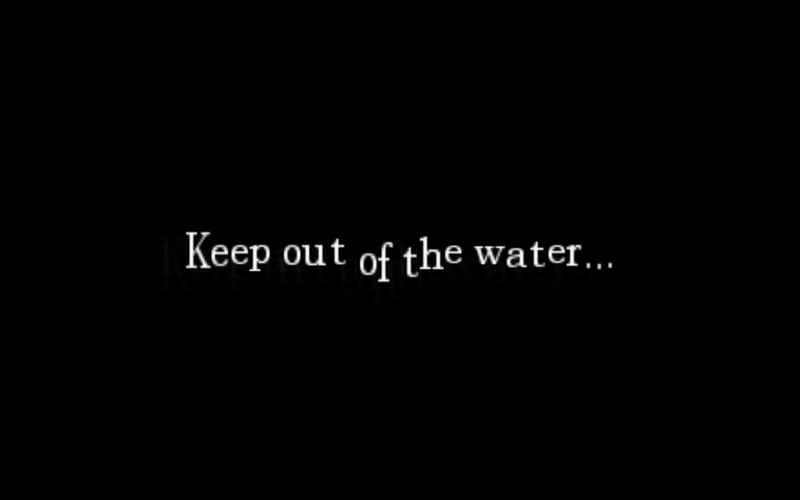 Yes, it took me 45min to get from title screen to The Water Part. Next time I played it, couple days later, I passed TWP and stopped 15min later. The last time I tried, I could handle no more than 5 min. And there was a 3 months gap since the second time. It wore me out. I can't stand anymore. I fired it up 2 months ago, and quit from the title screen. Never saw it again. But, if a videogame's objective is making you have experiences that wouldn't be feasible in real life, please, someone give a gazillion dollars to Frictional, because they just made The Perfect Game. 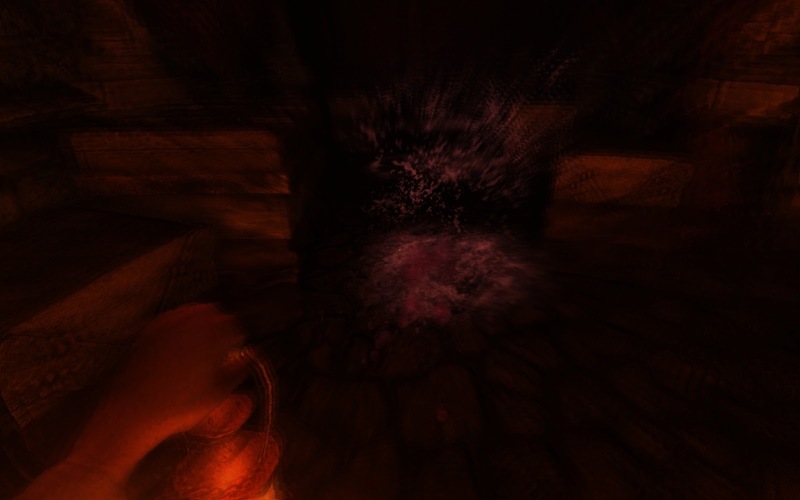 I think the water death bit is a bit unfair - the first time you encounter it, I think the normal reaction is to just stand there going "huh? what the hell?" It's almost felt like an imposed death.